At Master Mechanic, we’re all too familiar with this terrible scenario: you’re in a rush or late for a meeting, and you turn the key (or press the ignition button) and your vehicle doesn’t start. This can be a really frustrating experience—especially if you’re not prepared. Don’t panic, that’s what we’re here for. 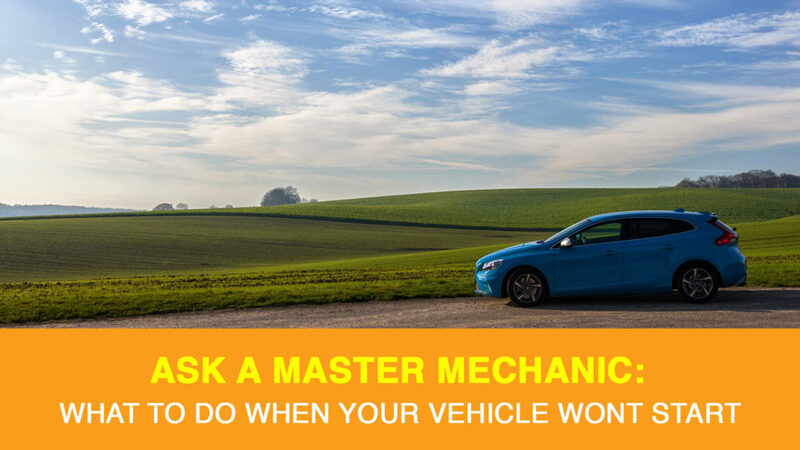 Let’s talk about what you can do if your car won’t start, and when it’s best to call your local Master Mechanic for assistance. Usually, when your vehicle doesn’t start, the problem is either battery or fuel related. In the low winter temperatures fuel lines can freeze. Moisture from condensation can accumulate in your fuel tank. The water is heavier than the fuel so it sits at the bottom of the tank and can turn into ice, restricting or even blocking the fuel pickup tube. If that’s the case, you’ll hear the vehicle/engine crank, but it won’t start. Here, being proactive is your best defence. Try and keep your fuel tank full or at least half full, to decrease the amount of air space in the tank. Less air space means less chance of condensation forming. Today’s lower and mid grade fuels already have ethanol in them so additional “gas line antifreeze” isn’t as necessary as it once was. However, users of some premium fuel should still consider it as not all premium fuels have ethanol in them. By far the most common culprit for a non-starting-car we see at Master Mechanic is the battery. If you go to start your vehicle, and nothing happens, listen carefully. If you hear silence or clicking, your battery is likely to blame. Turn on your vehicle’s lights. If they are dim, you probably have a poor battery connection or a dead battery. Loose or corroded connections can easily be cleaned with baking soda, water and an old toothbrush. Try tightening or cleaning the battery connections first, then attempt to start your vehicle again. If you need some help with this, check out this helpful article, or contact your local Master Mechanic. The automotive industry has had some incredible advancements in the last few years, that have made vehicles more reliable than ever. That said, there are still a ton of moving parts making your engine work, and even the most well-maintained cars will still have some minor issues. Most of the time, something as small as accidentally leaving an interior light on will drain your battery. If this is the case, you’ll simply need a battery boost. Keeping high-quality booster cables in your trunk is a good part of any winter emergency kitl, but please be careful. If you don’t know how to properly boost your car, or it still doesn’t start after you try, please contact your local Master Mechanic for more help. Most batteries have a lifespan of 2 to 5 years, so if you continue to have issues starting your vehicle, it might simply be time to have the battery replaced. Call or stop by your local Master Mechanic and we’ll gladly test your battery charge for free. The biggest thing to remember when your car won’t start is not to panic. It’s a much more common issue than you think, and if you have an otherwise healthy vehicle, it should be a quick fix. Your local Master Mechanics are always close by and happy to help with all your vehicle maintenance.